Oregon "Holly Blue Agate "
Occurrence: The chalcedony family (microcrystalline quartz). Occurs worldwide. 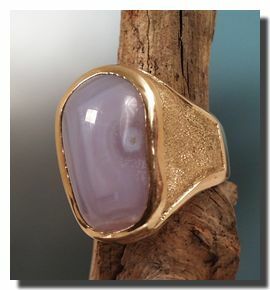 Appearance: Translucent violet-blue, sometimes banded like agate. Enhancements: Holly Blue is not enhanced. This incredible blue to purple seam agate is one of the most popular agates in the western Oregon area. There are also a few known and probably more undiscovered deposits of Holley Blue on the Calapooia River. The Holley Mt. area is the main area for this famous lapidary material. It is located on leased timberland. Bulldozed over and replanted it was closed to digging as of spring 1997. The land is leased to Cascade Timber Consulting, who currently control access to the site. People who have dug since then have been cited for trespassing, had their rock confiscated and were fined. At Present there is a fair amount of Holly blue on the market. The recent closures of Holly Mountain will soon change this availability.